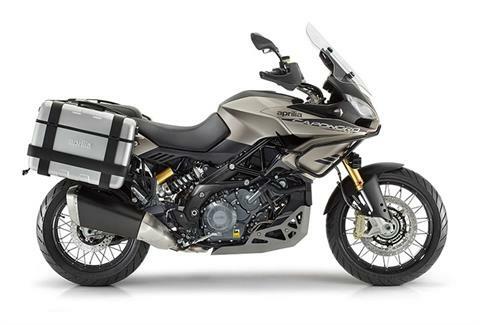 Aprilia introduces a new version of the super technological Caponord 1200 that breaks down the confines of paved roads to become even more transversal and suitable for any trip. Introducing the new Aprilia Caponord 1200 Rally: more eclectic, more protective, more comfortable, super equipped. The high performance of the twin-cylinder is a perfect match for the exceptional chassis features typical of all Aprilia bikes as well as the technological contents such as ADD, the semi-active suspension system that automatically adapts calibration based on road surface and riding style. NO MATTER WHAT GROUND UNDER MY FEET: After introducing the Caponord 1200, the perfect crossover for any type of road use, at the top of its category for technical content and chassis quality, Aprilia offers a version capable of pushing beyond the confines of paved roads, where travel turns into adventure. 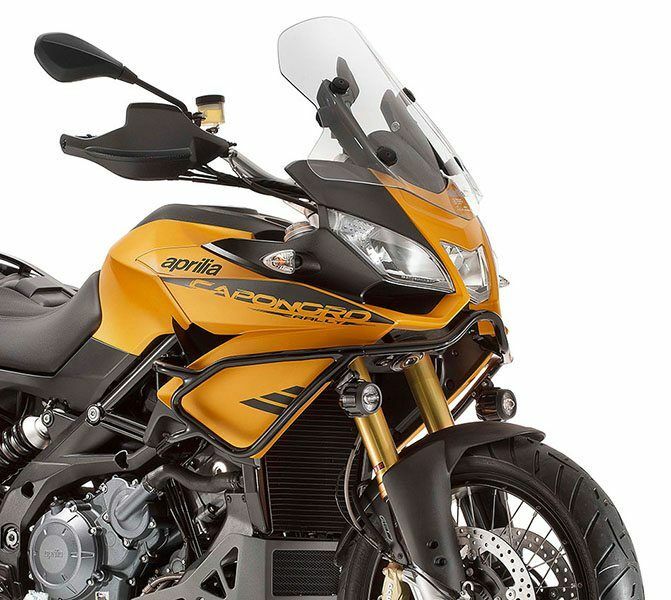 Introducing the Aprilia Caponord 1200 Rally, a spendid representative of the global bike, just as suited for daily commutes as for fun and long range touring, not only on asphalt. The names "Caponord" and "Rally" are evocative for Aprilia: the first was introduced in 2001 with the ETV 1000 Caponord, patriarch of an advanced interpretation of the street enduro concept, boasting distinctive elements such as the dual beam chassis in aluminum and the 998 cc 98 hp twin cylinder engine, both clearly sports derivations. Aprilia has historically associated with the term "Rally" with the most adventurous and offroad models (including the 2002 ETV 1000 Caponord Rally Raid), bikes dedicated to travel in its purest and most savage connotation, ready to take on any type of terrain. Then, like now, Aprilia's motorcycle technology was top shelf: the proverbial ability to build exceptional chassis is joined by exclusive expertise in electronics, thanks to the victories achieved in top level racings, which has always been at the center of research and development of Aprilia solutions which are then used in factory models. Ride-by-Wire, ABS, ATC, ACC and ADD are the active electronic control systems fro safety and riding pleasure that Aprilia has fine tuned for the Caponord 1200 Rally, combined with a modern and technological V2 powerplant with top notch torque and power characteristics as well as a standard setting chassis architecture. 90° V-TWIN: Caponord 1200 Rally is powered by the latest evolution of the Aprilia V-twin already successfully installed in the Caponord 1200. The Italian V-twin cylinder boasts extremely advanced construction technology and a careful study of internal fluid dynamics aimed at improving combustion, decreasing friction and maximising performance. The 1200 cc engine on the Caponord Rally benefits from a series of improvements and refinements in terms of settings, timing and electronic control. The natural developments of this twin which has taken place over time allow more progressive and responsive power output to be obtained even at low engine speeds (to the advantage of comfort) as well as enhancing riding pleasure thanks to high torque values, at the same time improving fuel economy. The general specifications of the Caponord 1200 Rally engine are: 1. Twin cylinder 90° V 2. Performance: max power 125 hp @ 8,000 rpm; max torque 11.7 Nm @ 6,800 rpm 3. Triple map Ride-by-Wire technology (Sport, Touring, Rain) 4. Highly oversquare bore / stroke ratio which is highlighted by the sport attitude and increases the amount of power generated from a low rpm 5. Double overhead camshafts driven by a mixed chain / gear valve timing system and four valves per cylinder 6. Twin spark ignition for fluid and full power output 7. Speed density type electronic fuel injection with two throttle bodies and double multi-hole injectors for each throttle body 8. Stick-coils integrated in spark plug boots 9. Three-way catalytic converter with double oxygen sensor 10. Hydraulically operated clutch 11. Exhaust compensator to improve the torque curve, especially in the engine mid-range. A product of the experience Aprilia has gained in competitions, the ultra-compact twin-cylinder engine from Noale is an Italian work of art even from an aesthetic point of view, thanks to the engineers' commitment to conceiving an ultra-modern engine where the data transmission system takes place over a CAN line which has the advantage of reducing the number of electrical cables in the harness. The 690W current generator is capable of powering the various electrical accessories in the rich options catalog without any problems. THE DEFINITIVE BIKE: Aprilia introduces the definitive bike, perfect for any occasion, the point of reference for form and function, where the personality so typical of Italian design is combined with a sleek body. Like every Aprilia, its sportiness shines through clearly in the main stylistic traits, immediately noticeable in the triple headlight, by now the distinctive mark on all later model Aprilia bikes. The overall shapes were drafted during the numerous wind tunnel sessions which led to finding a perfect balance between a highly compact form, optimum aerodynamic penetration and excellent protection from the wind. Guaranteeing maximum comfort for the rider and passenger are the oversized windshield which can be easiy adjusted in height, the hand guards and the particular profiles of the sides, designed for minimum protusion but protective at the same time. 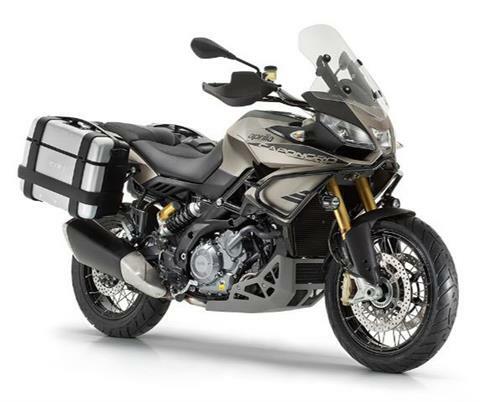 The adventurous style of the Aprilia Caponord 1200 Rally is completed by the metallic tubular side guards and the brand new guard under the engine. The pair of additional LED lights is also new, which helps to increase riding safety, especially in conditions where visibility is low. One of the most important aspects for a bike dedicated to accompanying riders on the longest and most demanding trips is the riding position. Aprilia Caponord 1200 Rally provides riders of any height with an erect and relaxed position, the result of specific ergonomic studies in search of a dominant position that would not be tiring during long trips with perfect control over the bike and a sporty ride on road and in light offroad riding, even upright. The saddle has a particulaly comfortable cushion and is just 840 mm off the ground, giving the rider total control over the vehicle when stopped. A lowered saddle is also available as an accessory to further reduce the distance from the ground. The passenger accommodations were also given particular attention: the portion of the saddle, large and flat, is separate from the rider's seat and shaped in such a way that prevents sliding forward, guaranteeing optimum comfort in any riding situation, while the ergonomic grab handles provide a firm and comfortable grip. "Rotational" technology allowed a thin walled nylon tank to be realised with great freedom of shape, favoring a reduction in weight. This way the lateral dimensions were reduced to a minimum and cater to the perfect leg position for the rider. The 24 liter capacity guarantees long range travel with a full tank. 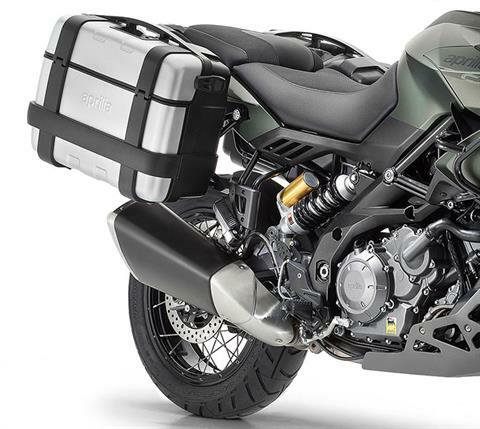 The design of the Caponord 1200 is completed by its side panniers, elegrantly covered in aluminum and each with a 33 liter cargo capacity. Once mounted, the lateral dimensions are very contained; this result also contributes to the adoption of an exhaust system with a low mounted silencer. The panniers practically adhere to the profile of the tail fairing (total dimensions are only 920 mm) and do not create a nuisance for the passenger, making for an easy climb on board and a comfortable ride. If the panniers are not fitted, the silencer is height adjustable, giving the vehicle a more aggressive look and increasing ground clearance in turns. RIDE-BY-WIRE: Aprilia was the first to believe in Ride-by-Wire, the electronic accelerator and the result of a sophisticated technology introduced for the first time in the sport motorcyle world in 2002 with RS Cube and on factory bikes as early as 2007 with the Shiver 750. The efficacy and reliability of this system have been taken to new heights on the Aprilia Caponord 1200 Rally. The RbW system dialogues perfectly with the engine ECU, managing the power in the best possible way at each point of the power output arc in order to have jerk-free manageability at low rpm, extreme responsiveness at medium rpm and exemplary spurts at high rpm. An efficient engine also provides the indisputable advantage of optimising fuel economy. TRIPLE MAPPING: The triple mapping (Rain, Touring and Sport) that the rider can even select on the fly, lets you have a bike with three distinct personalities, capable of instantly adapting to any possible condition and preference. All the rider needs to do is close the throttle and press a button to choose the desired setting. 1. SPORT: maximum performance with responsiveness and direct power output, to satisfy a sporty riding style. 2.TOURING: the maximum power expressed is the same as the Sport mapping, but output becomes more fluid and suitable for daily riding or touring. 3. RAIN: power is limited to 100 hp in order to guarantee maximum control and safety in conditions of poor grip. ABS & ATC: ABS and traction control (ATC) (which can both be disabled) are included as factory equipment on the Caponord 1200 Rally. The two channel ABS system is specifically calibrated for the Aprilia Caponord 1200 Raly version. The particularly fine calibration allows the rider to make the most of chassis potential in sport riding, without ever being invasive, even in the most intense braking operations, whilst still guaranteeing maximum safety on slippery surfaces. ATC (Aprilia Traction Control) is the exclusive patented traction control system derived from the Aprilia Performance Ride Control (APRC) system on the extraordinary RSV4, designed and fine tuned by Aprilia to get maximum grip on any type of surface, able to provide the rider with great riding confidence, simultaneously increasing safety. The 3 control settings, specifically calibrated for the demands of the Aprilia Caponord 1200, can be adjusted based on different riding styles and asphalt conditions. 1. Level 1: for a pure sport riding experience, intended for good fun. 2. Level 2: suitable for the city and touring in general to manage the engine's performance on any route. 3. Level 3: ideal for safety taking on difficult situations such as low grip surfaces, staying in complete control. ADD: Aprilia Dynamic Damping (ADD) is the dynamic semi-active suspension system developed by Aprilia and protected by four patents, the reference point where technology, efficiency and reliability are concerned. Once again, Aprilia has proven to be on the cutting edge of electronics applied to bikes thanks to a latest generation suspension system that manages to increase safety, comfort and riding pleasure. The ADD system measures the energy transmitted by bumps on the road surface to the bike and adjusts the hydraulic fork calibration and shock absorber in real time to minimise accelerations on the frame and consequently optimise comfort. To achieve maximum performance at any fork and shock absorber operating frequency, ADD uses a patented "comfort oriented" algorithm which combines the principles of the well known skyhook and acceleration driven damping algorithms. In addition to comfort, rideabiity is also enhanced and safety is increased thanks to further software strategies which are tied directly to the rider's actions. In fact, the system recognises the riding phases (accleration, throttle release, braking, constant gas) and adjusts the basic fork and shock absorber settings thanks to yet another patent which allows specific hydraulic calibration curves to be defined within the adjustment range. The high precision of the system is entrusted to a selection of sensors which are derived from the automotive world and which, in addition to guaranteeing absolute reliability, allow the fork and shock absorber extension speed to be measured with maximum accuracy. In this field, Aprilia has patented a unique solution for measuring the fork extension speed: using a pressure sensor. In the electromechanical calibration suspension systems already available on the market, the rider presses a button on the handlebar to activate an electric motor which changes the suspension set-up. 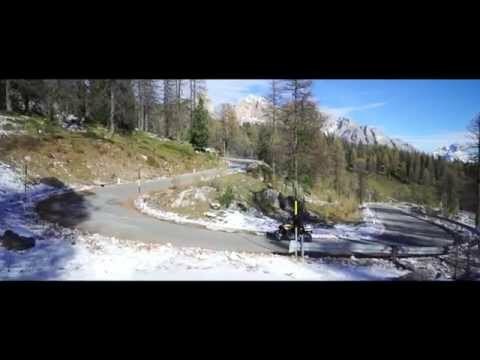 In the Aprilia ADD dynamic semi-active suspension system, on the other hand, all the rider has to do is ride without any concerns of selecting one setting or another. At the rear a built in piggy back shock absorber is used, electrically adjustable in spring preload to 4 predefined positions, indicated by specific icons on the digital instrument panel: rider only, rider with passenger, one rider with panniers and rider and passenger with panniers. Aprilia system patented exclusive and then the automatic preload control mode for the spring. Once this option is selected, the system is able to detect the bike's load by itself (weight of the fuel, rider, passenger, luggage, etc.) and automatically adjust preload to the optimum value for correct balancing on the bike. The ability of ADD to perfectly copy even the smallest imperfection of the road surface, thereby guaranteeing the best possible tire grip, also allows the Aprilia Caponord 1200 Rally to achieve exceptional braking distances, unheard of on the competition's bikes. CRUISE CONTROL: Aprilia Cruise Control allows the desired speed to be set and maintained even on uphills and downhills, without touching the throttle control. The system disengages automatically if the rider touches any of the brake / clutch Cruise Control commands and is very useful on long motorway routes because it helps save fuel and makes the rider less tiring. INSTRUMENTATION: The instrument panel that equips the Caponord 1200 Rally is fully digital: The full LCD combines the speedometer, rev counter, total and two trip odometers, fuel level and coolant temperature. There is also a selected mapping indicator (S, T, R) as well as the shock absorber electric spring preload indicator. The engaged gear is also indicated, as well as the ATC level adjustment and heated hand grip operation (available as a separate option). The range of indicator lights on the side includes the fuel reserve warning light and the ABS, ATC and ACC activation / deactivation indicators. ALWAYS CONNECTED: The link between the vehicle and the internet is called A-MP, Aprilia Multimedia Platform, making travel safer and more convenient. This is a window to the future which lays the foundation for a new way of looking at communication on two wheels. Once the free app has been downloaded, the Bluetooth pairing of the smartphone to the vehicle allows the various options to be viewed and easily modified to the rider's preference: speedometer, rev counter, but also instantaneous engine power and torque, lean angle, longitudinal acceleration, instant and average fuel consumption, average speed and battery voltage are just some of the features that can be accessed. A-MP stores all the travel information and allows it to be studied in depth at a later time on your computer and it also contains the operating and service manual for your vehicle. Front - 320 mm floating double disc with aluminum carrier. Radial mounted four pistons per caliper with steel braided brake lines. Rear - 240 mm wavy stainless steel disc. Single piston caliper with steel braided lines. Aprilia 90° V-Twin, 4-stroke, four valves per cylinder. Ride-by-Wire system with 3 engine maps. Rear - Double sided aluminum alloy swingarm. Sachs monoshock absorber with adjustable preload and rebound damping controlled with ADD (Aprilia Dynamic Dampening); 150 mm travel.